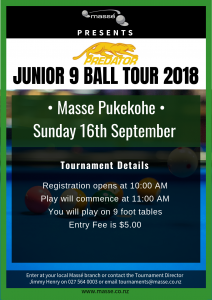 The second tournament for the Predator Junior 9 Ball Tour will be held on Sunday 16th September. Registration is at 10:00 AM – Please plan your travel time to ensure you arrive on time. Play will commence at 11:00 AM. Participants must be aged 20 years or under as at December 31st 2018. You will play on 9 foot tables.